Jim Atchison CEO SeaWorld admits the: "best thing to do is to take action to help them IN THE WILD". Jim Atchison, CEO SeaWorld, "makes no excuses for the way they treat" orca...Whaaat?! on NBC's Today Show this morning. 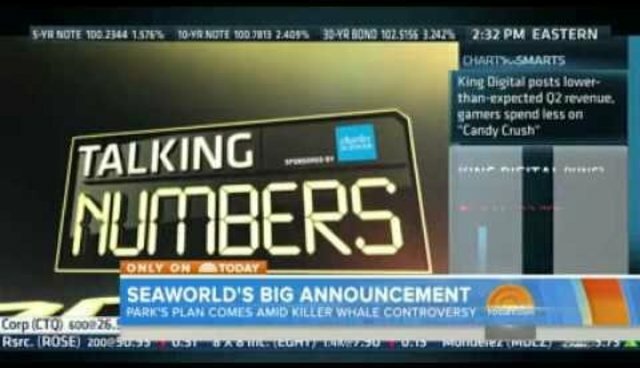 His announcement of plans to waste money building a 40×50 FOOT bathtub for Orca contradict his own statements to press on live TV. Considering orca swim a mile easily in the wild, extending captivity in a larger bathtub is a travesty. Aaaah yes, Jim, the key word is: #release...#Release...#RELEASE! THAT IS OUR FINAL ANSWER MR. JIM #ATCHISON, CEO SEAWORLD↔#RELEASE your #mealticket #emptythetanks #create #wild #ORCA tours, which START OUT passing by SeaWorld's new Seapen where SeaWorld #rehabilitates #rescues PRIOR to #release. Market specials: release tours, wild orca and dolphin WATCHING TOURING, rescue programs for volunteers wanting experience for careers in marine sciences. Geeeeez-get with the program would ya? What's the thinking behind dilly dallying? You profess to want to motivate people to: "take action to help them IN THE WILD". BE THE EXAMPLE. Stop lolly gaging around the issue of M-O-N-E-Y. You can't spend what you already have in your lifetime. How does YOUR income stack up to SeaWorld's CEO JIM? Click the link above to see for yourself.